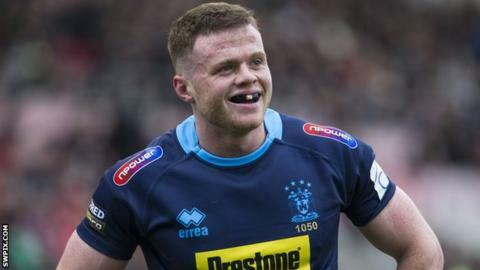 Wigan's Joe Burgess scored his first tries since recovering from a serious knee injury to help the champions thrash Catalans 42-0 in Super League. George Williams picked him out with a high kick before half-time and after the break the England wing scored in the corner following a neat move. His third was a length-of-the-field effort, replicating what Oliver Gildart had done for his own try earlier. Zak Hardaker and Jarrod Sammut then crossed to cap an emphatic win. Hardaker's try was the former Leeds and Castleford full-back's first since joining the Warriors. He finished the day with 18 points, missing a couple of conversions but adding two penalty goals. Wigan move to eighth in the table after securing back-to-back wins for the first time this season. While last week's triumph at Salford was hard fought, this was a return to the sort of form that helped the club lift the Grand Final trophy in October. What both wins did have in common was a player grabbing a hat-trick of tries, Burgess replacing Williams as this weekend's hero and taking his tally of trebles for the Cherry and Whites to seven. Gildart, however, probably beat him to try of the match - his interception was perfectly timed to allow an equally impressive sprint for home. For Catalans it was another capitulation after their recent 46-0 home thrashing by Salford, which they had recovered well from with two narrow wins. But this result shows those defensive frailties remain very much a problem as defeat leaves the French side seventh, two points ahead of Wigan. "I could feel a result like this coming. Even though it was only 8-0 at half-time, we had a few chances that we didn't take. "We were completely beaten in every department by a team that were really hungry and energetic. We were exactly the opposite. "I thought we prepared really well but we came out and put in a disgraceful performance. "We've had two big defeats - one at home and one away now - we are kidding ourselves if we think we are anywhere near good enough right now. "Quite clearly we're not mentally at the stage yet to be able to compete right at the top." Wigan: Hardaker; Manfredi, Sarginson, Gildart, Burgess; Williams, Sammut; Bullock, Leuluai, Navarrete, Isa, Paisley, Partington. Interchanges: Shorrocks, Smithies, Flower, Byrne. Catalans Dragons: Tomkins; Yaha, Langi, Wiliame, Tierney; Gigot, Smith; Casty, Albert, Moa, Edwards, Whitley, Bird. Interchanges: Bousquet, Goudemand, Baitieri, Kasiano.